A trip to Hawaii often brings to mind images of sparkling white-sand beaches, endless blue waves and palm trees dancing on the breeze. While these features of Hawaii add to the stunning aesthetic appeal, first-time visitors to the Hawaiian Islands may be surprised by the enchanting beauty of the mountains that make up a large part of this land. Towering peaks and luscious valleys filled with tropical wonder make Hawaii’s mountainous landscape quite unlike any other. 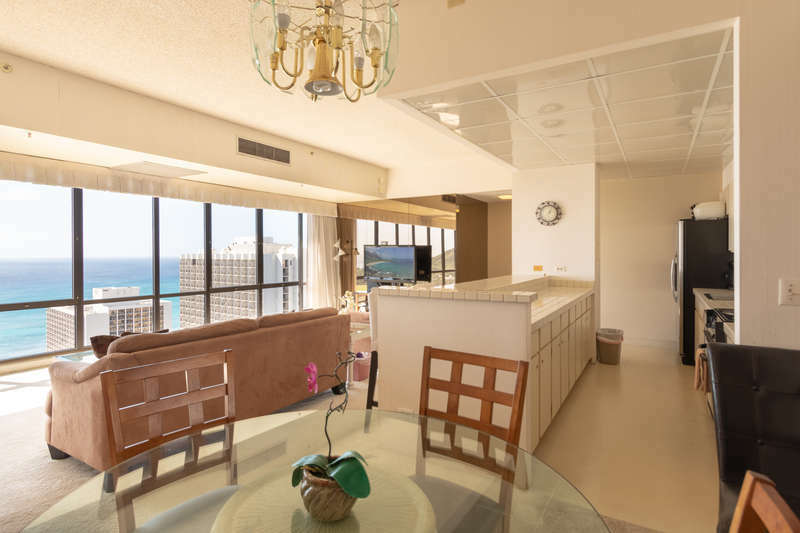 When you’re here and looking to make the most of this incredible view, be sure to book a Mountain View, Hawaii resort rental with Koko Resorts. 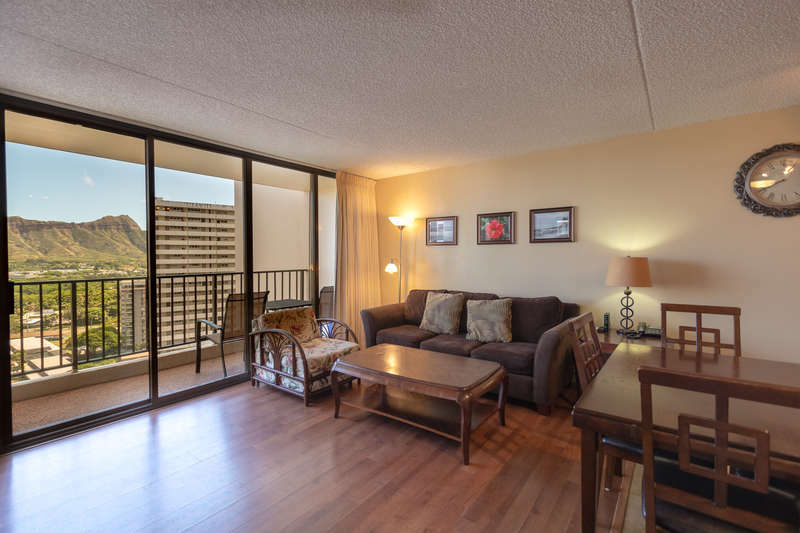 While many of our Mountain View, Hawaii resort rentals come with undeniable island-style, it’s the comfort that keeps guests coming back time and again. There’s nothing better than waking up after a wonderful night’s rest and moving out to the balcony with a cup of coffee in hand. Once you’ve breathed in the island air and feasted your eyes on the mountain ranges standing majestically around you, you’ll never be the same again. 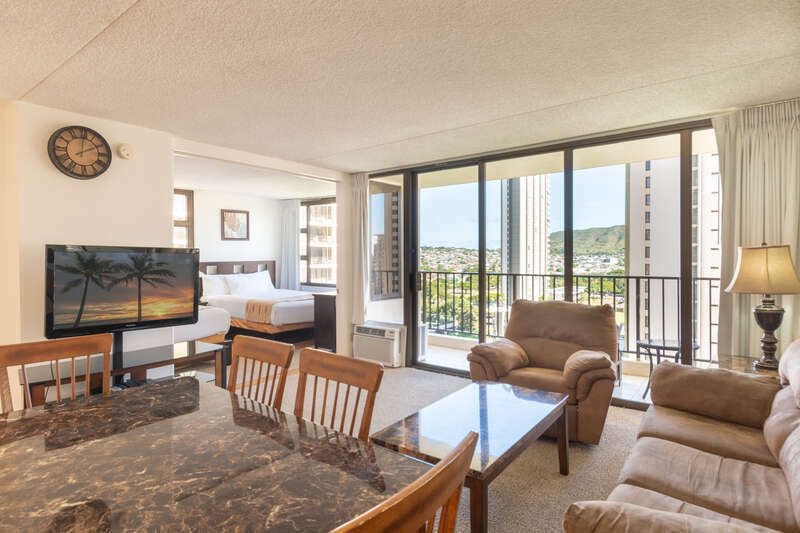 Many of our resorts near Honolulu come complete with stylish furnishings as well as high-speed internet, large screen televisions and fully-equipped kitchens. Traveling chefs will appreciate the modern appliances including a stove, refrigerator, and microwave that make a night of dining-in convenient and simple. A tropical vacation is about the view, but it’s also about the luxurious extras that make a getaway unforgettable. When you’re here, let us know if we can help you book a location that provides access to a pool, extra large patio or balcony, tennis court or BBQ grills. Earn extra peace of mind when you request a stay that comes complete with 24-hour security. The Hawaiian Islands are unmistakably beautiful thanks to their phenomenal natural landscapes, but this area is home to some creatures that are just as wonderful. When you’re here, make sure to book time on a whale watching cruise. Excursions that depart from Maui come highly recommended and generally last 2-hours. Guests will get an up-close look at some of the ocean’s most spectacular and massive creatures while learning what it takes to preserve the ecosystems these mammals need to thrive for years to come. Be a part of the brilliant landscape, beauty, and excitement that makes Hawaii so special when you book our resorts near Honolulu. When you stay with us, you stay with family and we work hard to make sure you’re booked into a location that feels like your true home away from home. Contact us today to begin planning!